ith rose gold as the color of the year and simplicity as the greatest comeback, people do not only infuse simplicity in fashion or minimal makeup, but also in jewelry. Something about simplicity in jewelry makes them attractive, you might not want your jewelry to be over the top as it steals the attention from your outfit, but simple jewelry can always make your outfit stand out even better. I know there are a lot of jewelry out there with the theme of simplicity, but I have been needing a new watch lately and I have come across Olivia Burton, which is famous for its simple designs and customizable features. In my previous post, I have posted about the Danielle Wellington watches, which they are similar to Olivia Burton in some ways, but watches in Olivia Burton provide a greater variety of simple and vintage designs. It is actually the most popular watch brand in the UK, and right now very popular in Hong Kong as well. The Olivia Burton watch I have comes in rose gold color and a light grey strap, the dial is a big dial where everything in it are in rose gold color. Rose gold is basically my favorite color, it gives out a classy and noble feeling without being too outshining, the color is basically modern and stylish. The dial of my watch is plain and simple, with the sun-ray effect which reflects light to make the rose gold color pop out even more; I also love how soft their leather straps are and how the second hand moves silently (not soundless but it is quiet enough for me, as I know some other watches have very loud second hand and I do not like them very much). I am obsessed with most of the Olivia Burton watches, especially their floral and marble patterned dial which can totally calm your mind when you are looking at your watch. So if you wanted something with simple pattern and light colors, Olivia Burton watches should definitely be on your wish list. 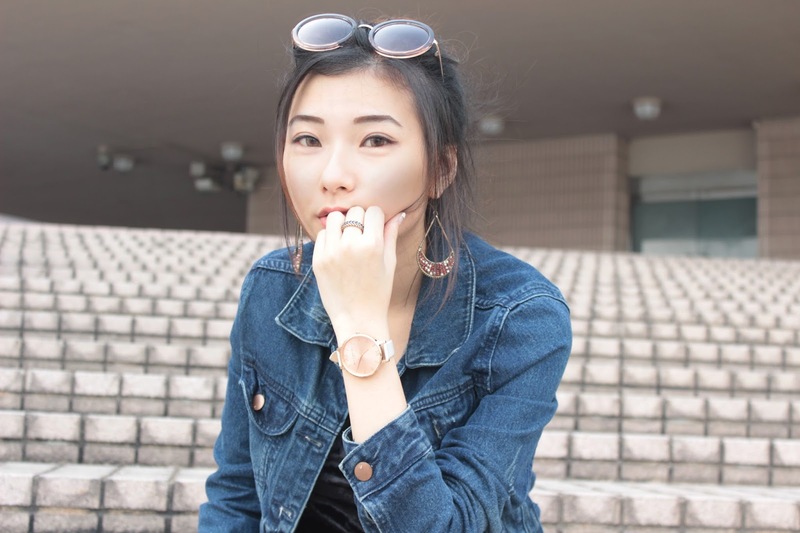 I find rose gold color watches can basically pair with any kinds of outfit, the timeless design of Olivia Burton's watches gives my outfit a touch of classiness and modernity at the same time. Although rose gold goes with basically every color, I find it pairs best with black or white clothing; so I threw in a black velvet dress and a denim jacket and they pair up perfectly. I have relatively pale skin so the rose gold dial gives my skin some warmness, as well as the photo; but if you have relatively tan skin, rose gold works perfect on you as it somehow makes your skin glow (I am not kidding, but the glow is not highlighter-glow). I usually choose mini dial when it comes to watch because my wrist is pretty small, mini dial has a more solemn and classiness compared to large dial. This time I try it with large dial and it turns out pretty well as it goes along perfectly with everyday-outfit with a sense of youth. The rose gold dial reflects light really well (especially when it has sun-ray effect on the dial) which can easily catch people's attention of the watch I am wearing. The simple design of their watches also allows me to pair it with other accessories, without being too over-the-top. What I really love about Olivia Burton's watches are that they are very easy to customize and personalize. They provide many other different straps for you to change the strap of your watch according the needs of different occasions. So without having to change your watch every time, you can change the straps instead. They also offer personalized service which allows you to emboss your name or initials on the leather strap of your watch, which by the way is amazing that you can have the one-and-only watch in the world. You can get my rose gold Olivia Burton's Watch over HERE in Argento, which is the largest official Olivia Burton Retailer. when checkout for all Olivia Burton & Daniel Wellington watches BEFORE 7 APRIL! And if you are from Hong Kong like me, you will probably want to go check them out because some of their pricing are definitely cheaper than the retail price in Hong Kong. 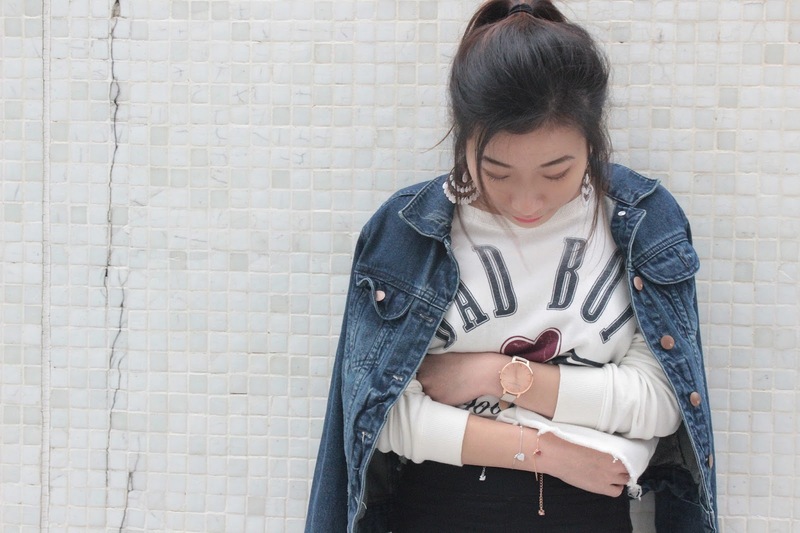 You now can also get free delivery once you spent HKD$1800. Tell me about your current favorite watches, or anything you love about Olivia Burton's watches, I would love to know your thoughts!